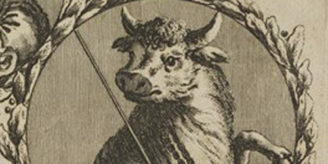 Item of the Month: Vivat! Marking the 60th anniversary of the coronation of Queen Elizabeth II, William Schupbach, Iconographic Collections Librarian, explores the local environs of the Wellcome Library, then and now. The painting above shows Euston Road in London, 60 years ago, early in the evening. The street is deserted except for a couple of red buses and a taxi. It does however sport the red, white and blue bunting that was installed for the coronation of Queen Elizabeth II on Thursday 2 June 1953. The next coronation, whenever that might be, will show whether the country still has the money and the will to extend its London street decorations as far north as Euston Road. 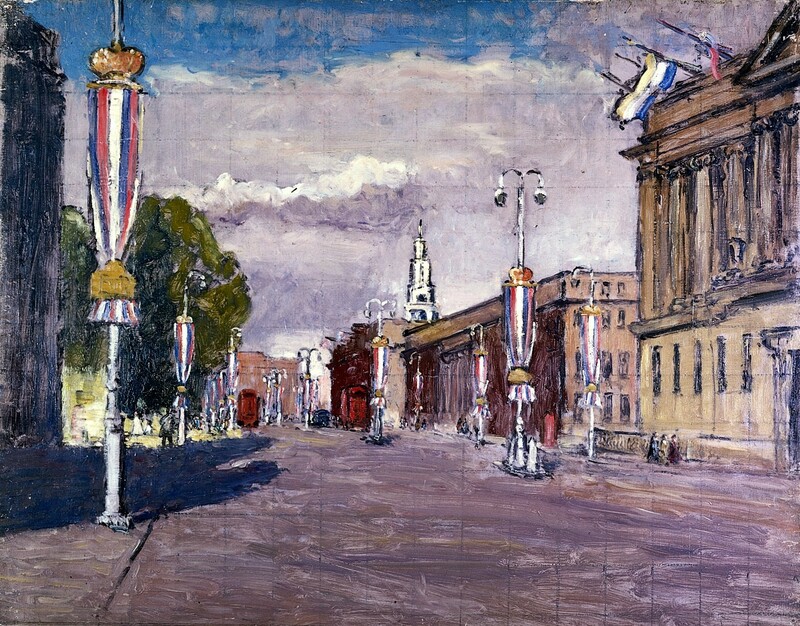 The cast-iron lamp-posts have long gone, but most of the buildings shown in the painting are still standing, though others have been added, and many have changed their use. On the right is the Wellcome Building, the home of the Wellcome Library. In 1953 the building was called the Wellcome Research Institution. Originally built to house some of Henry S. Wellcome’s collections and make them available for use — hence the name of the building — it had been occupied since World War II by the Wellcome Foundation Ltd., the pharmaceutical company whose original headquarters in the City had been destroyed in the Blitz. The flags floating out over Euston Road will have been installed by the pharmaceutical company. On the left is the Euston Road wing of the building, now called 30 Euston Square, which was designed by A. Beresford Pite for the London, Edinburgh and Glasgow Assurance Company and built in 1906-1908. Beresford Pite’s building has been listed for preservation by English Heritage. In 1953 the building is shown as blackened by traffic and chimney smoke: London’s Great Smog had occurred the year before, and the UK’s Clean Air Act was not passed until 1956. 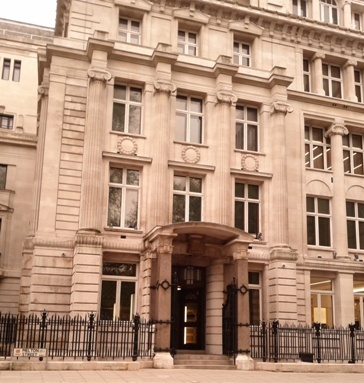 In 2013 however the building is gleaming white, having been recently refurbished as the new headquarters of the Royal College of General Practitioners (founded in embryonic form in 1952). The college has opened up atria and other large spaces for meetings at the back and top of the building. Beresford Pite’s entrance hall, however, has been restored, and his cream-, bottle-green-, and amber-coloured ceramic walls have been gloriously conserved. The College has also conserved the large zodiac circle in mosaic on the floor of the entrance hall: is this the only insurance company headquarters that greeted its visitors with an astrological symbol? The planners of the proposed HS2 railway from Euston to Birmingham have drawn a line around at least the southern part of this building to spare it from the mayhem proposed elsewhere in the Euston district. The building was formerly No. 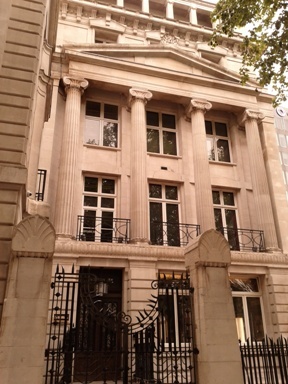 1 Melton Street but is now numbered 30 Euston Square. Both addresses have been problematic. There is a sign indicating Melton Street immediately outside this building, but for some years the sign was regularly defaced by — presumably — a fan of Elton John, who used to delete the M of Melton. Euston Square is now a somewhat incoherent series of buildings a distance away from the Underground station named after it. If the plans for HS2 go ahead, most of Melton Street will disappear and the structure of the square will become even more illegible, but at least this corner will be firmly anchored by Beresford Pite’s building, as it is in the painting. The shadow on the road in the painting seems to represent the twin turrets of Bentley House, 200 Euston Road. Built by Cambridge University Press in 1938, it was occupied by the Wellcome Library between 1989 and 2007, and is now being turned by the Wellcome Trust into 171 student residences. The interior is currently being demolished, but the façade including the two turrets is being retained. The direction of the shadow means that the sun is in the west, suggesting that it is the eve of the coronation, 1 June 1953. Further down Euston Road on the right one can see the brown brick exterior of Drayton House, the offices which form the western wing (now let to UCL’s Department of Economics) of the Quaker headquarters and meeting house, Friends House. The building is of course undecorated. 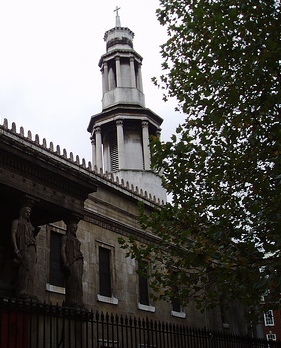 Above is the white tower of new St Pancras Church, built by William Inwood in 1819-1822. The tower was modelled on the Tower of the Winds in Athens as a result of studies in Athens by the architect’s son Henry William Inwood in 1818-1819. William’s decision to send his son to Athens was momentous, for it established the Grecian style of the Euston area, including the Doric Arch (1837; demolished in 1961), the Beresford Pite building, the colonnade fronting the Friends House Meeting Room (1927; in 2013 about to be completely remodelled internally), and the Wellcome Building (1932). The painting is the work of Paul Ayshford Methuen RA, 4th Baron Methuen (1886-1974). His seat was Corsham Court in Wiltshire, a notable house full of Old Master paintings mostly collected by one of his ancestors who had been British ambassador in Lisbon in the 18th century and by another who had been a clergyman in Florence in the 19th century. Though he had a degree in zoology and was active in animal conservation, the 4th Baron took painting lessons as a pupil of Walter Sickert, and in 1959 was elected a Royal Academician. There are 81 paintings by him in the Your Paintings database, including one of the coronation of King George VI in 1937. 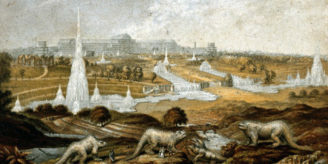 The Euston Road painting is squared for transfer, whether to aid translation from a drawing to this painting or from this painting to another, larger, version (or both). Exposed gridmarks are the signature style of artists of the Euston Road School: though Methuen was not a member of the school, it is appropriate that their distinctive feature is displayed in a painting of the Euston Road itself.